See that polyhedral object on the board, the one with 20 sides, that isn’t a dice. No that is my dreadnought class capitol ship, slowly making its way towards your homeworld. See those four sided dice grouped around it? Those are a squadron of small and agile fighters ready to strike ahead of the main fleet. 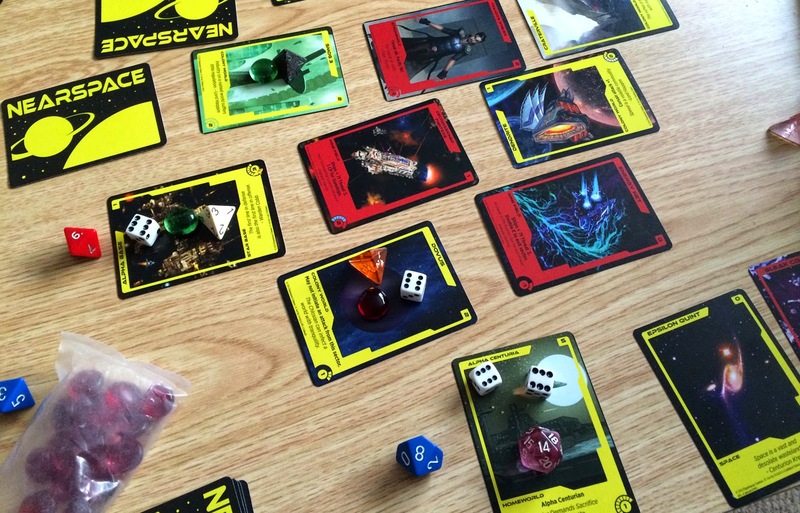 Using dice to represent ships in intergalactic combat is quite popular at the moment and in Nearspace you’ll use them to explore new territory and destroy your foes. Nearspace is a straightforward 2 player 4X game, and by 4X we mean explore, expand, exterminate and, erm, xylophones? You’ll be presented with a galaxy of unexplored space and on the other side of it, your enemy’s homeworld. Your aim is to spread out into the stars and smash your opponent into oblivion. This is done by building ships to explore systems and claiming planets rich in resources to expand your fleet. As you explore you’ll find colonies, star bases, alien races and empty space, as well as some nasty surprises like minefields and pirates. If you find a system you don’t like then don’t fret as you are an advanced civilisation and the option of terrraforming is always available to you. You have a reserve of three cards and you can always spend resources to change a location to one in your reserve. If you’ve got the nerve and the resources you can also do something really nasty like change a valuable system near the enemy’s homeworld into an asteroid field! Terraforming is a costly endeavour mind you, and it ties up resources that could be spend on new fighters but it allows players to change the playing field quite drastically and means that you’re not limited to the cosmos you’re dealt. To find and control these systems you’ll need ships. This is the really neat aspect of Nearspace; each ship in the game is represented by a dice, the number of faces representing the attack power, speed and construction cost. The less faces the lower the power but also the easier they are to build and the quicker they move around the board. Larger ships take longer to build and are slow to move but can pack a serious punch. Everything is controlled by the number of faces, a six sided gunship costs six resources to build and costs six movement to jump systems, the combat strength of a ship is simply the result from rolling that dice. It’s a simple but also really thematic combat system; while it’s more than likely that a 20 sided dreadnought will blow a 4 sided fighter into space dust there’s still a chance that the fighter gets a proton torpedo down an exhaust port and wins the day. There’s a clever balance between resources and the size of your fleet. You have to pay upkeep on the number of ships in the game. It means that a small fleet of larger ships is easier to maintain but more expansive to build. It’s another little decision that makes this simple game so meaty. Movement also plays an important decision as the amount of movement points available to you is based on the roll of your engine dice, a 20 sided polyhedron mass collider if you will. If you want to guarantee the movement of your larger ships then you’re also going to need to build more hyperspace engines. It may seem like an odd criticism to level at a game, but in some ways I think Nearspace has too many rules. The developers have obviously tried to cram a lot into a simple game, and sometimes the extra level of complexity doesn’t quite pay off. The ships, for instance, have additional rules based on the number of faces, this isn’t too bad as it means you can build carriers bristling with fighters but there are rules that give ships bonuses depending on what colour the dice are. Since you use your own dice and they could be any colour, the developers have covered all eventualities and rules for 13 different ship types are included. In the games we played we decided that this was a level of complexity too far and decided to ignore these colour based bonuses. There’s also the deck designing aspect of the game. 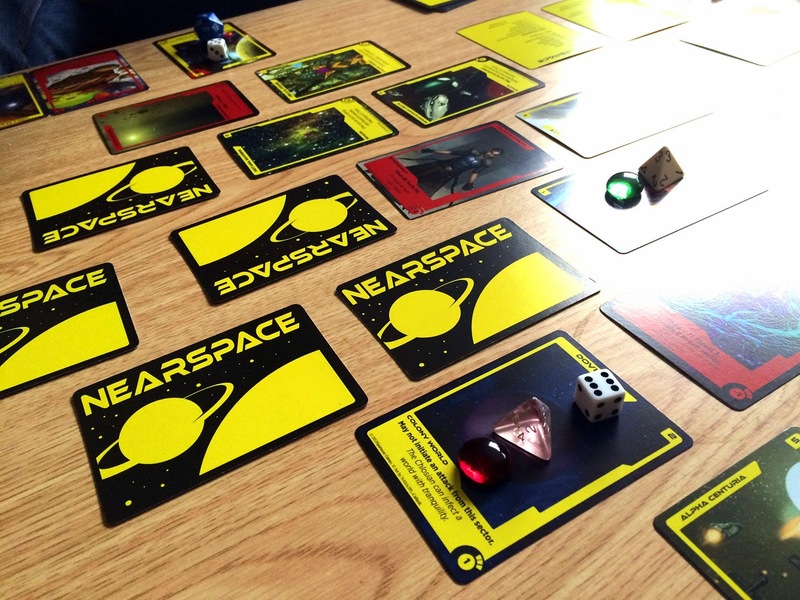 Nearspace is as a customisable game; the cards that represent the unexplored space, events and resources are intended to be customised by players before the game in the same way you’d build up a deck for a customisable card game. It’s a well thought out feature, as you do have to balance both good and bad cards in the deck but I also think it’s a feature that few players are going to take full advantage of and I would like to see some rules for a random draw set or some well balanced pre-constructed decks. And then there’s the dice themselves. The base set of Nearspace won’t come with any dice and you are expected to supply your own. If you’ve ever played an RPG this isn’t going to be a problem but if you don’t have a pool of dice to hand you’re going to want to invest in some. The idea here is that you can build up a deck and set of dice that match up, further expanding the customisable nature of the game. Again it’s not a feature I can see me taking advantage of but it will increase the longevity for those players that really get into the game. Nearspace crams a lot of 4X game into a simple and easy to play experience. It may lack the complexity of bigger games such as Eclipse or Twilight Imperium but it more than makes up for that with a quick and simple game that punches above its weight. It delivers many of the difficult decisions, resource management and tactical placement that larger games offer but in a smaller, more digestible format. The customisable nature of the game means there are plenty of opportunities to expand the game further and develop your own strategies. Nearspace is currently on Kickstarter and has a goal of $9500.